Hina Khan has been the talk of the town ever since she appeared on the reality show Bigg Boss. The actor is currently busy with her recent show Kasautii Zindagii Kay where she is playing the role of an antagonist. Hina, who is very active on social media, keeps sharing pictures of herself in gorgeous outfits. The television star shared a picture where she can be seen donning a pink satin dress. Recently, a fashion critic criticised the actor for copying an international label. Earlier the same critic with the Instagram handle Diet Sabya trolled another television star Divyanka Tripathi, for sporting a copy of a Sabyasachi belt. 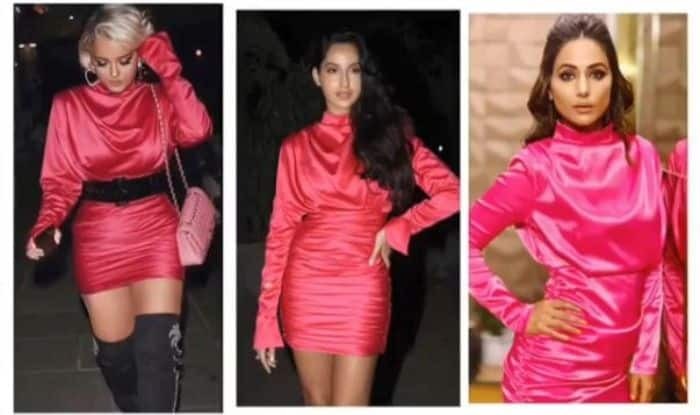 Diet Sabya has now targetted Hina and trolled the actor by sharing a collage of international singer Bebe Rexha, actor Nora Fatehi and Hina Khan and asking the viewers to spot the fake. While earlier, Divyanka had a strong reply to Diet Sabya, we wonder if Hina is going to react to it. Earlier Hina talked about her break from Kasautii Zindagii Kay, Hina told Bombay Times, “I am not quitting ‘Kasautii’…, but I am going on a break for five-six months, as I have given my nod to a movie. I can’t disclose much about the film, but yes, I have communicated my decision to the makers of the show. Having said that, I will be back on the show whenever I am required. In the earlier season too, the track would change and Komolika would take a break and come back. As of now, I won’t be seen post March”. Hina is debuting in Bollywood with a film in which she is playing the character of a Kashmiri girl. Veteran actor Farida Jalal will also be playing an important role in the film. For her comeback on TV after Bigg Boss, the actor chose to appear as Komolika, the famous vamp, on Kasautii Zindagii Kay. However, the current track hasn’t really been able to grip the audience.